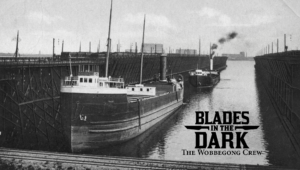 In which the Wobbegong Crew pay to avoid prison, learn that the Red Sashes snitched, witness the beginning of a serious rift in the Billhooks and take Red Sash turf for their own. Charming: He was separated from the rest of the crew for most of the job and managed not to kill anyone. In his downtime, he did some healing and some stress relief with his buddy, Sawtooth. Skannon: Our stealthy scoundrel took a beating this game, getting a 2nd trauma, Haunted, after he ghost cloak’d his way through the floor to avoid an irate Red Sash and nearly destroyed the ghost ward in the lower decks. The dice were not kind to Pete tonight but Skannon was still awesome. Maude: She led the charge into the Pig Pit during downtime. She started and completed a short clock to ally with the Lampblacks and hit a big crit to notice a big rift between Erin and Coran, putting together that Erin’s lover is the leader of the Red Sashes. Good stuff. Another big moment was using a ghost to take out a flare meant to alert the Red Sashes and summon a war crew. Muade had a helluva night. The Billhooks: Tension in the Billhooks gang is written in but today we learned a bunch about how that is shaking out. The group tripped over the tensions between Erin and Coran, both vying for control as the gang while Coran’s father/Erin’s brother serves time in Ironhook Prison. I like Edlun more and more. Morlan: One of the Billhooks saved by the Wobbegong’s in their first job. He accompanied them into the Black Dust Pub as a go-between. The Upper Deck: This is the drug den the Red Sashes owned, taken by the Wobbegong with Lampblack help. It is a scuttled ship on the docks whose lower decks are flooded. There are buildings built on top of the ship. The 5 Faces of the Moon: A Brightstone drug den with fine hash and dreamsmoke. The Leaky Bucket: This is where the gang planned the job with the Lampblacks. Sean mentioned it and it worked. Is it in the book? Not sure. I started the job with a 4 part clock for the guards surrendering and that was a poor judgment. I changed it to a 6 part clock, making the job less easy (but still not that bad). The Billhooks Civil War (6 tick). Oh, it is coming and it will be bloody. Upper Deck’s Ghosts Come for Skannon (6 tick). This was part of a Devil’s Bargain. I’m feeling odd about these because I haven’t seen one of these clocks go off yet but I know the players are watching them and they are exerting pressure in some way. I might have to make these somehow more urgent or worded better. I’ll keep an eye out. The Entanglement Roll that started the gang was rolled with 0 dice. That means I roll 2d6 and take the lower. Once again I rolled double 6’s, a result that calls for someone in the crew to go to jail. They paid Edlun coin to keep their crew out of prison and tossed in an extra coin to find out who snitched. It was the Red Sashes. The job was born. Good job, entanglement. I rolled to see how the war between the Lampblack and the Red Sashes was going. The Red Sashes rolled 6 and the Lampblacks rolled a 2. It wasn’t looking good for the Lampblacks; they were taking a beating and had taken heavy losses. The Lampblacks were ready for an ally. I described the Upper Deck to the group and they were into taking it. 2 guards at the gang-plank and 3 more on the old, beat-up, grounded ship. They decided they would stealth across the water onto the ship while Charming dealt with the gang-plank bouncers. Dice hit the table and things got complicated. Skannon took trauma and everyone took stress. It was a rough job and it could have been much, much more rough if Maude hadn’t nullified the S.O.S. flare, if Charming hadn’t beaten down the last door, if Skannnon hadn’t weaved the ward back together. It was good stuff, solid teamwork. 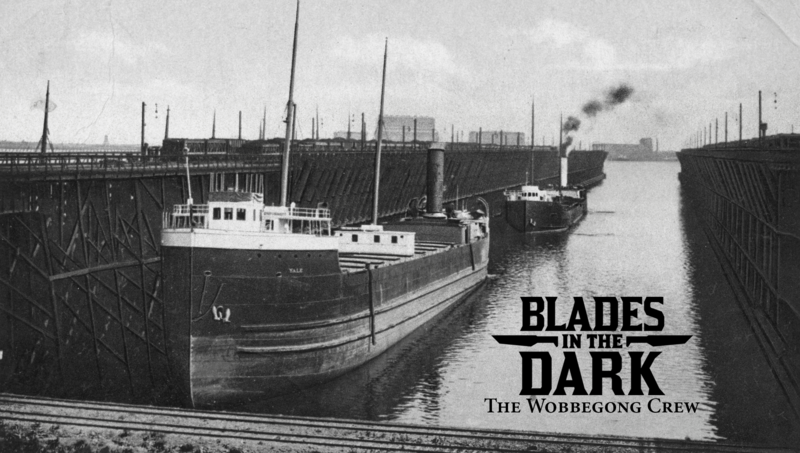 Now the team has a drug den on the docks, a grounded schooner that is also haunted – as it was used as a meat locker for enemies by a long dead gang. That is a juicy piece of turf, a nice new part of the Wobbegong mythology. EDIT: Re-thinking the Upper Deck Job is a blog post in which I think about this job and how I would’ve done the engagement roll differently if I could go back. The Scoundrel’s Grind is in effect and the players are feeling it. They were careful to grab turf without killing anyone. I need to make an Action Roll cheat sheet for myself, just something fast and easy to get an idea of what kind of consequences I can offer for the various types of failures and consequences for success-with-a-price results. Having a rule mentor at the table is a tremendous help. I had Jim and Aaron when I was playing Burning Wheel and Sean is invaluable for getting all of the moving pieces that make up Blades in the Dark. Being discovered by a bystander or someone who works for your target that isn’t loyal, but is self interested. They want to be paid off, to come along, for you to do something for them, else you’ll have to silence them another way. The place you’re going into is different than you expected. Environmental hazards: traps, ghosts, swimming, tight crawl spaces, deathlands ash, a maze, snakes, poisonous gasses, locked doors, dimensional portals. The people you’re trying to blend in with or avoid do things you’re not prepared for: drugs, passwords, supplication to a demon, wearing fancy or distinct clothes, dancing, socializing, holding a meeting, interacting with another crew (possibly an enemy crew), friendly contests, moving to an unexpected place. Something holds you up and can’t come with: Gear lost, party split, silence prevents communication, niggling doubt, some time bomb you’re aware of, another concern that distracts you, or that you have to choose between. More? I’m sure there are tons. Help me brainstorm more so that next time I’m GMing and someone gets a partial success or bad outcome when Prowling, I have some idea for complications. Also worth noting I accidentally didn’t save the VOD in time (as word to the wise, Twitch only keeps non-affiliate videos up for 14 days. Make your highlights soon!) so the video for this session is sadly lost in the archives of Twitch ephemera. On a person character notes, I had some great luck tonight. I rolled a critical success on a Study roll to find out what Erin and Coran were up to, and realized that the reason the Billhooks didn’t want to fight the Red Sashes was that Erin and Mylera Klev were secretly lovers. Thus the starting of the Billhooks civil war! (No ticks on it yet, but we know it’s brewing). I also loved using Compel to force a ghost to fly up and burn out a flare before it could go off in the air. That felt like it was the difference between ending the job and it turning into something even bigger! Getting Mylera’s little brother as a captive. Dang, that’s going to spin some heads!